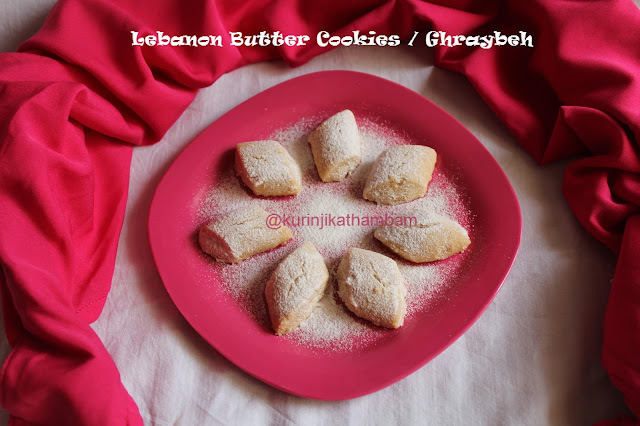 Lebanon Butter Cookie, Ghraybeh, is very easy to make because it has only 3 ingredients. It has a heavenly taste and make first time cookie makers to really start enjoying cookie making and would inspire them to make more and more cookies. Normally I don't taste the cookies while making them. But Lebanon Butter Cookie tempts me so much that I can't avoid tasting one immediately. 1. Add butter in a wide bowl. Beat the butter till it reaches the fluffy and creamy consistency using wire whisk or electric beater. 2. Now add ½ cup of Icing sugar and rose essence. Mix them well with spatula. Then mix them well with whisk or beater. 3. Then add the flour little by little and mix them well. Knead it into a soft and pliable dough. 4. Take apple size ball from the dough and roll it into ½ inch a log (1/2 inch thickness cylinders like diamond bars) on the floured surface. 5. Now cut the cylinder into ½ inch thickens bars diagonally. 6. Place these diamond bars on the ungreased baking tray with 1 inch gap between them. 7. Preheat the oven for 200 degree Celsius for 10 mins. Bake this for 15 mins at 150 degree Celsius. 8. Take them out from the oven and cool down slightly. 9. Then take the cookies from the tray and arrange them on the plate. 10. Now sprinkle the ¼ cup icing sugar over the cookies using the tea filter. 11. Allow it to cool down completely and serve or store it in an air tight container for later use. Wow aromatic and delicious mouth melting Lebanon cookies ready!!! 1. 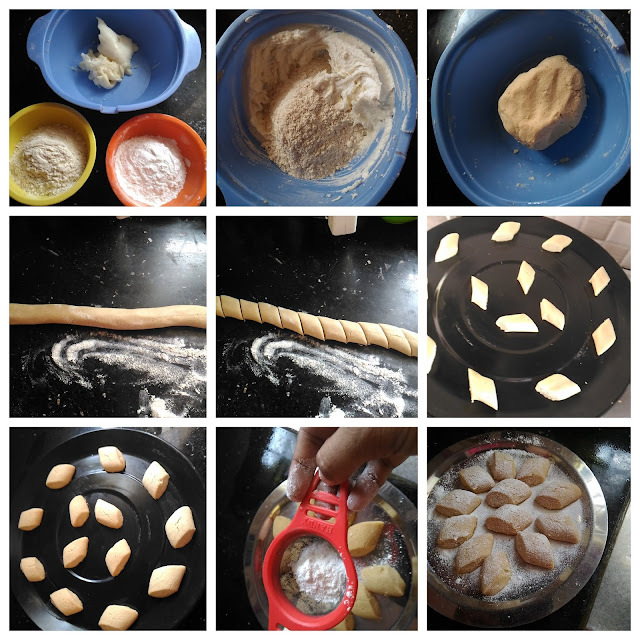 Use maida instead of wheat flour. 2. Use orange blossom essence instead of rose essence. 3. Keep this at room temperature for 2-3 weeks.